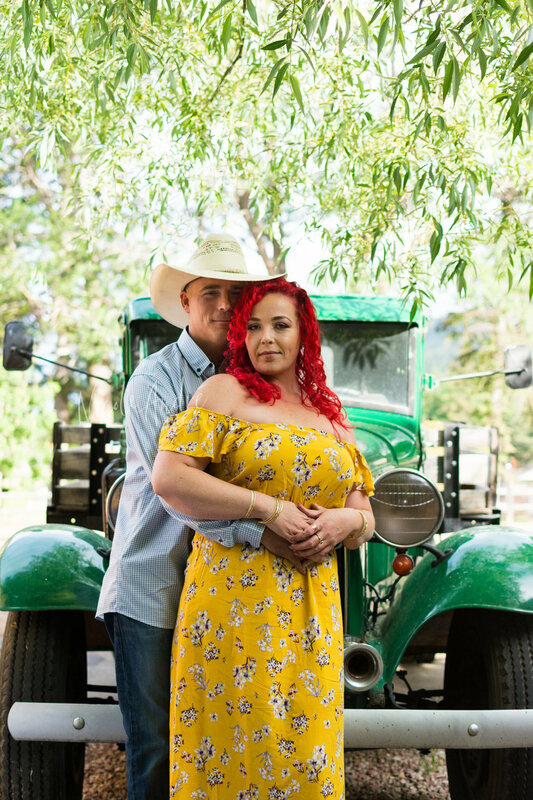 There is so much I loved about photographing this beautiful couple - of course, the brightly colored hair, the cowboy hat, the fact that they could not stop showing how much they loved each other. An engagement session is all about expression and showing off the love you have for your fiancé. These photographs are the beginning of a story waiting to be told and I am ready to capture the beginning chapters. Green Mountain Falls, Colorado has a ton of unique spots for photographs, whether it is the vintage car (see above) outside of a restaurant or the circular sculpture below - this town was made for photography. And can we talk about how much Rickie reminds me of Kenny Chesney??? His outfit was complete with cowboy boots and southern charm. He was such a gentleman and had a "go with the flow" attitude that made photographing this couple easy as pecan pie. Jessi's red hair was a huge inspiration for this session, but I didn't want it to overpower the photos. It was so important to find a place that would highlight the hair color while also highlighting their love for one another. The unique, but small town of Green Mountain Falls was perfect. I used these dandelions to add some texture to these photographs and even asked my assistant to blow the petals directly in front of my lens. Nothing like a few wishes to add a bit more romance to their session. 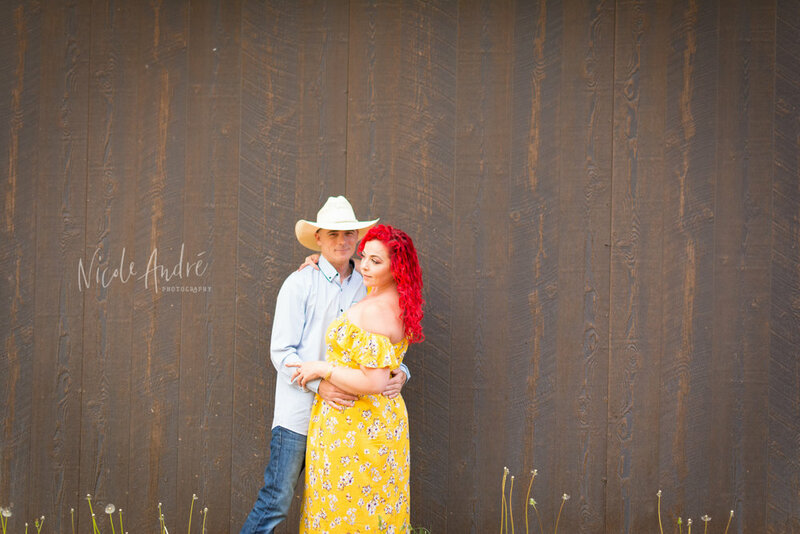 Every photo from this session was magical and its easy to see this couple has a beautiful relationship. I changed the location of the session at the last minute and I am so glad that I did! Matching up a couple with their perfect location is what I aspire to do with each and every session. 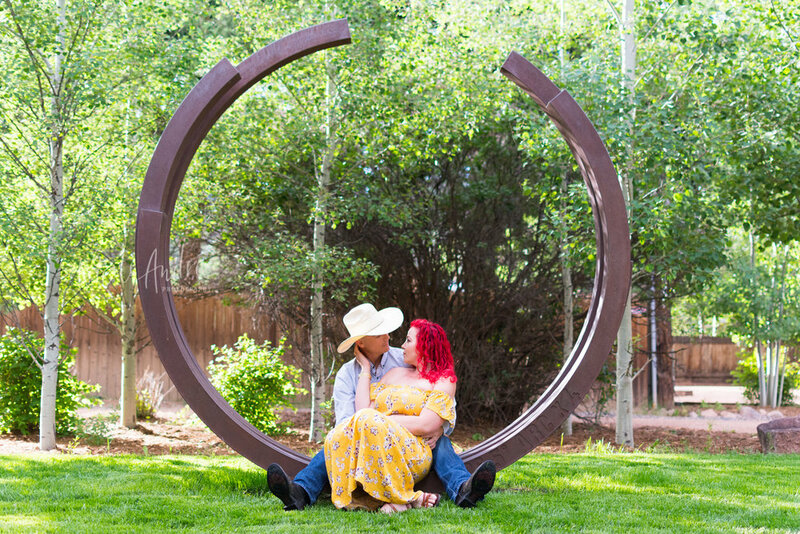 Location is so much about bringing out the best in your subject - here it has brought out the love Jessi + Rickie have for one another. Don't forget the details during these engagement sessions. Focus on the way they hold hands. I offered to drive them back to their car at the end of the session, and they both responded "No, its beautiful here, we will walk." They strolled along the path, hand in hand. Down the road a bit from Green Mountain Falls is Chipita Park (walking distance). There are a few bridges and a quiet stream, but the real beauty in this location is the stick sculpture "Footprint in Green" by Patrick Dougherty. It was an awesome backdrop for some unique photographs. Just a simple touch of the chin is the sweetest gesture. Who doesn't want love like this? They completely nailed every pose throughout their session. Whether it was a romantic glance, snuggling (not too tightly), or just being comfortable in each other's arms. They made the magic and I photographed it.